The immense online resource is designed to greatly enhance our understanding of the world's diminishing biodiversity. The creators of the database say it could have an impact on human knowledge comparable to that which followed the microscope's invention in the 1600s. It is designed to be used by everyone from scientists to lay readers. The Encyclopedia of Life (EOL) - described as the "ultimate field guide" - is to encompass all six kingdoms of life, and even viruses - which many researchers do not consider to be living organisms. Those behind the sprawling database say it could help scientists assess the impact of climate change on animals and plants. It may also help foster strategies for slowing the spread of invasive species and allow the spread of disease to be tracked. Another stated aim is to raise consciousness of biodiversity at a time when our planet is said to be in the midst of a sixth mass extinction. The immense amount of information in the encyclopedia is being drawn from a variety of sources, including several existing specialist databases such as AmphibiaWeb and FishBase. "The thing that makes the encyclopedia possible now, when it would not have been possible five years ago, is that there are many online resources that have been developed which we can draw upon," Dr James Edwards, executive director of the Encyclopedia of Life, told BBC News. "Secondly, information technology has reached a point where you can pool bits of information from different sources and present them in the way that, for example, Google News does... we're using the same kind of approach." Those sources which provide information to the encyclopedia do so for free, with the aim of driving new users to their websites for additional, subscription-based information. "If someone were to sit down and start writing, from scratch, an encyclopedia of life, it would take them about 100 years to complete. But we think we'll be able to do it in one-tenth of that time," explained Dr Edwards. The project began in spring 2007. The encyclopedia now has placeholder pages for one million species, of which 30,000 have been populated with detailed information. There are also about a dozen highly developed multimedia pages giving a taster of what to expect in time from the EOL. All 1.8 million entries are due to be complete by 2017. "On every page, there is information provided by the World Conservation Union on [a species'] status, showing if it is threatened, endangered or extinct," said Dr Edwards, "We think it is important to serve information on organisms that are doing okay, but also those that have been recently extinct." 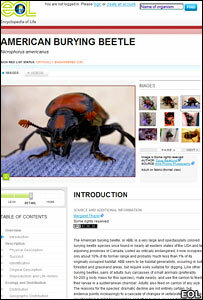 The encyclopedia's creators also aim to get information online as soon as possible when new species are identified. The project will solicit the help of users to submit photos and information for assessment by an authentication team. Although the idea of a catalogue of life has been around for some time, this particular version can trace its origins to an article written in 1993 by the celebrated Harvard University biologist Edward O Wilson. In it he argued that the biological sciences needed the equivalent of a "Moon shot". In 2006, Wilson wrote a letter to the Chicago-based MacArthur Foundation outlining his idea, which helped secure preliminary funding for the project.